Just one night. That’s how long this restaurant and music club in downtown Malden will be open. Malden Reads is coordinating a “pop-up restaurant” as part of their 2015 One City, One Book program. On Friday, April 17 from 6:30 – 11:30 p.m., the former home of Fizz Ed and (previously) My Honey Fitz at 142 Pleasant St. will be transformed into a one night dinner venue with entertainment. The pop-up dinner will be coordinated and prepared by local chef David Stein, who will work with Malden’s own Heritage Truck Catering Company from Stock Pot Malden (previously Brother Trucker) to provide a dinner buffet from from 6:45-8:15 p.m.
From 8:30-11:30 p.m., the venue will transform into a music club boasting roots rock, blues, funk and R&B from the local band Soulshine, also featuring David Stein and his wife Sue on vocals. Stein was inspired by the Malden Reads 2015 featured selection “Mr. Penumbra’s 24-hour Bookstore” by Robin Sloan. In the book, there’s a scene with a temporary restaurant called POP-UP PIE, which plays a role in the secretive plot to decipher the coded book at the center of the story. The dinner buffet will feature Garden Salad with Grilled Spring Asparagus, Low and Slow Smoked BBQ Brisket of Beef, Herb Roast Chicken “Scarborough Fair”, Roast Vegetable Lasagna, Creamy Spaghetti Squash, Southern Style Greens, Roast Red Potatoes and Cornbread, and dessert (TBA). The event will also serve up beer from Everett’s Nightshift Brewery plus Red and White Wine and Lavender Ice Tea, Blueberry Lemonade & Soda. 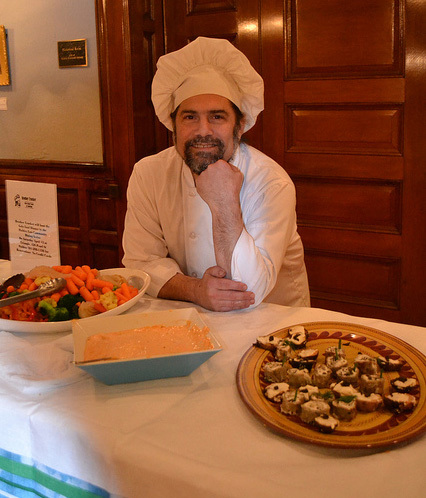 Local chef and musician David Stein bring his own energy and the force of his new venture with Stock Pot Malden to a one-night-only-event in Malden, a Pop-up Restaurant at the former home of Fizz Ed and My Honey Fitz, as part of the 2015 Malden Reads program offerings. The pop-up restaurant is this year’s finale event of the community dining series offered by Malden Reads in collaboration with Malden Eats. The latter is a venture created by Stein, with local residents Paula Spizziri and Michele Marcinowski, whose goal is to promote mutual appreciation of Malden’s diverse cultures by supporting local, independently-owned restaurants. Community dinners are staged at neighborhood eateries offering a prix fixe menu in a warm and convivial atmosphere. Malden Reads is a community reading program that seeks to answer the question “What if all of Malden Reads the same book?” It is organized by local residents, city leaders, and school representatives in collaboration with the Malden Public Library and MATV, Malden’s Media Center. Stock Pot Malden, funded by Co-Creation Ventures, is a Malden-centric business with a focus on supporting cultural diversity and celebrating entrepreneurship and fine food. With limited seating, Stein urges residents to RSVP as soon as possible. Tickets are $22 for music, one beverage and the dinner buffet. For those coming at 8:30 p.m., tickets are $7 for music and one beverage. Tips would be appreciated. Payment at the door, cash only– no credit cards accepted. To reserve, call 781-605-1954 and make sure to specify the reservation is for the Malden Reads Pop-Up Restaurant. Leave your name, number in your party and contact information (phone or email.) If you are not able to attend the dinner, please call to cancel. Yum! Eat and then dance it off! Great combo!